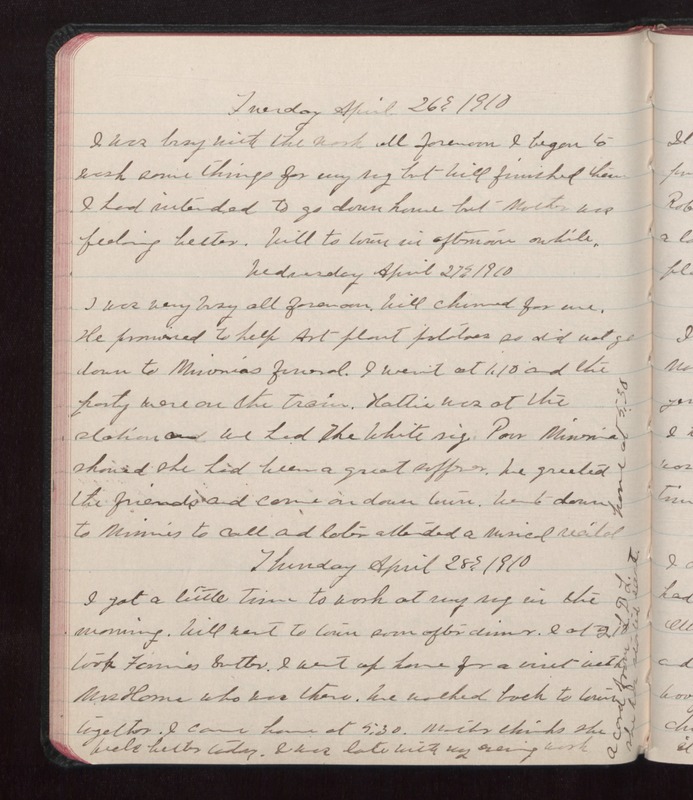 Tuesday April 26 1910 I was busy with the work all forenoon I began to wash some things for my rug but Will finished them I had intended to go down home but Mother was feeling better. Will to town in afternoon awhile. Wednesday April 27 1910 I was very busy all forenoon. Will churned for me. He promised to help Art plant potatoes so did not go down to [Misonia's?] funeral. I went at 1.10 and the party were on the train. Hattie was at the station and we had the White [illegible] [Misonia?] showed she had been a great sufferer. We greeted the friends and came on down town. Went down to Minnie's to call and later attended a musical recital home at 5.30 Thursday April 28 1910 I got a little time to work at rug [illegible?] in the morning. Will went to town soon after dinner. I at 2.18 took Fannie's butter. I went up home for a visit with Mrs Horne who was there. We walked bak to town together. I came home at 5.30. [illegible] thinks she feels better today. I was late with my evening work. A card from L D L. She has started east.